"Human resources is the operational key to success for all growing businesses. A great idea can't go anywhere without a great staff." Great companies, and great teams, are built and nurtured from the new hire and orientation process all the way through strong retention efforts. Symmetry Consulting is the go-to source for small businesses seeking reliable, current human resource advice, support, and advocacy. 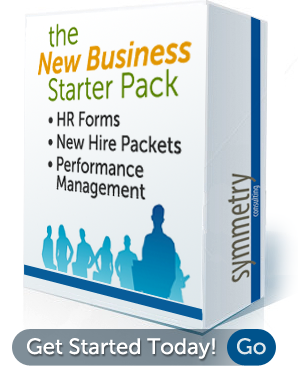 Our services include HR starter kits for new businesses, human resource management, executive search and recruitment, and a help line to answer your human resource questions. Contact us to learn more! Visit our events page for upcoming webinars and speaking engagements. Learn more! Tools, best practices, and thoughtful stories for small business owners. Step-by-step human resource advice from experts. Find, interview, and hire top performing employees. Expert human resource advice and day-to-day management. Tips and news about human resource management.